John McCain—the original Maverick, ol’ Walnuts, the brave teller of truths—is somehow once again positioning himself, to credulous journalists, as a renegade Republican who isn’t afraid to buck his party, despite his three-decade record of not ever actually bucking his party in any meaningful way. “John McCain just systematically dismantled Donald Trump’s entire worldview,” the Washington Post’s Aaron Blake says of a speech McCain gave in Munich, in which he didn’t mention the president, whose cabinet he has largely voted to confirm. A more accurate way of phrasing “(ambivalently, agonizingly) taking on the president” might be “not actually taking on the president.” McCain has supported every one of Trump’s nominees besides one: budget director Mick Mulvaney, who lost McCain’s support because he has supported defense budget cuts. McCain’s sole inviolable principle is that we must spend an unlimited amount of money on war with everyone forever. Ever since his longtime aide and ghostwriter Mark Salter wholly invented McCain’s “maverick” persona from whole cloth in the late 1990s, the sum total of McCain’s record of brave or maverick-y actions consists of “giving good quote to reporters.” That’s it. In 2008, the press mostly, finally fell out of love with McCain, in part because he was running against Barack Obama, but also because it became painfully clear that McCain was and always had been a mostly unremarkable party-line Republican, whose obvious discomfort with the far-right was not actually supported by the backbone necessary to challenge the far-right. Now, with a deranged Republican president and a wholly Republican Congress, McCain will once again try to paint himself as a voice of reason and a courageous truth-teller, while not actually doing anything. 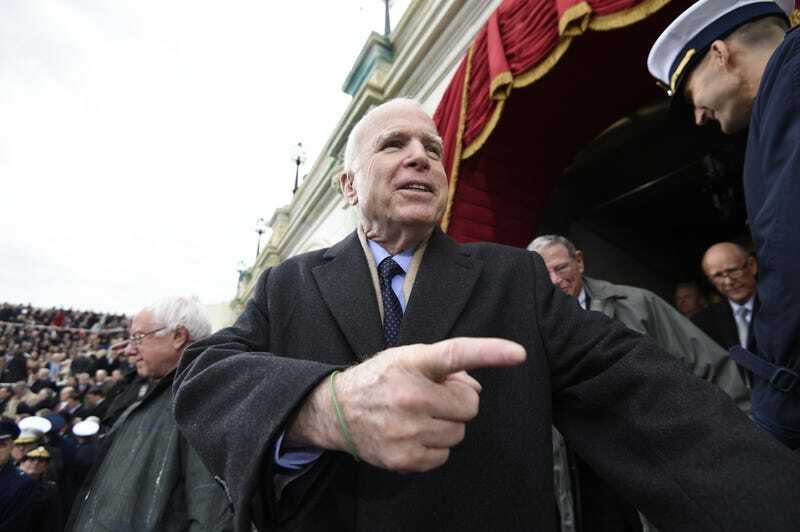 Most of the political press is amnesiac and sycophantic enough to fall for it again, but it is obvious at this point in his long career that Senator John McCain is not going to “fight” Trump. He’s going to say various anti-Trump things, on TV and to reporters, while never using his very real power as a senior Republican senator to interrupt the implementation of Trump’s, and his party’s, eschatological agenda.